In Coimbatore, the BJP Office was hurled on Tuesday night with petrol bombs. This may be a retaliation of a Periyar statue vandalisation in Vellore. Police informed that in this incident in Coimbatore, Tamil Nadu, no one was injured. The footage of CCTV shows men hurling the BJP office with petrol bombs. On Tuesday evening, anti-touchability activist statue and Dravidian movement leader EV Ramasamy, who was referred to as Periyar commonly was vandalized in the Vellore district, Tamil Nadu by two men. 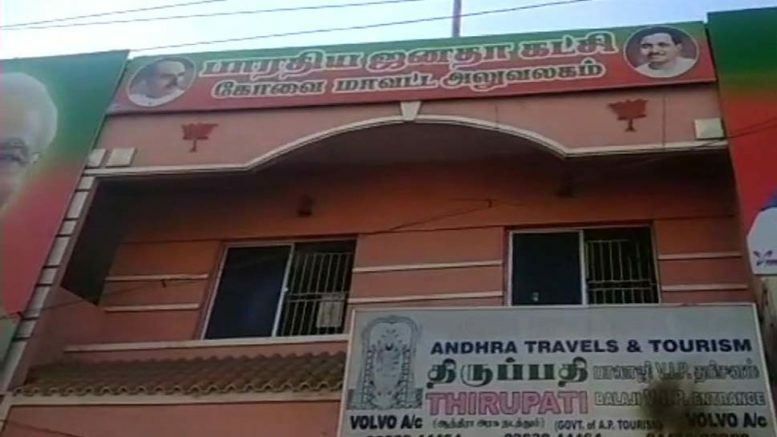 According to the police, around 9 pm, the statues were inside Tirupathur Corporation Office and these were damaged by the vandals. They were caught by locals before inflicting further damage and were handed over to the police. Police identified them as Muthuram and Francis. Muthuram is a BJP worker and Francis is a CPI activist, said the police. The attempt of vandalism came hours after H Raja, the senior BJP leader said Periyar was “casteist” and exclaimed in a Facebook post for the reformist’s statue to be “destroyed”. However, he deleted the post on facing the backlash. The Facebook post referred to the south Tripura incident, where BJP supporters alleged brought down the communist revolutionary statue, Lenin using a JCB down on Monday and after two days the party won the state assembly elections. On Tuesday, another statue of Lenin was brought to the ground. The Raja’s post having Periyar reference was criticized heavily online, following its leader took it down. He also said reportedly that someone had posted inadvertently on his page. Be the first to comment on "Coimbatore BJP Office Attacked with Petrol Bombs after Periyar Statue being damaged by Vandals"